The Pre-Raphaelite Brotherhood (later known as the Pre-Raphaelites) was a group of Thomas Woolner to form the seven-member "brotherhood". The group's intention was to reform art by rejecting what it considered the mechanistic approach first adopted by Mannerist artists who succeeded Raphael and Michelangelo. Its members believed the Classical poses and elegant compositions of Raphael in particular had been a corrupting influence on the academic teaching of art, hence the name "Pre-Raphaelite". In particular, the group objected to the influence of Sir Joshua Reynolds, founder of the English Royal Academy of Arts, whom they called "Sir Sloshua". To the Pre-Raphaelites, according to William Michael Rossetti, "sloshy" meant "anything lax or scamped in the process of painting ... and hence ... any thing or person of a commonplace or conventional kind". In contrast, the brotherhood wanted a return to the abundant detail, intense colours and complex compositions of Quattrocento Italian art. The group associated their work with John Ruskin, an English artist whose influences were driven by his religious background. Through the PRB initials, the brotherhood announced in coded form the arrival of a new movement in British art. The group continued to accept the concepts of history painting and mimesis, imitation of nature, as central to the purpose of art. The Pre-Raphaelites defined themselves as a reform movement, created a distinct name for their form of art, and published a periodical, The Germ, to promote their ideas. The group's debates were recorded in the Pre-Raphaelite Journal. The Pre-Raphaelite Brotherhood was founded in John Millais's parents' house on Gower Street, London in 1848. 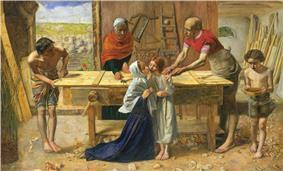 At the first meeting, the painters John Everett Millais, Dante Gabriel Rossetti, and William Holman Hunt were present. Hunt and Millais were students at the Royal Academy of Arts and had met in another loose association, the Cyclographic Club, a sketching society. At his own request Rossetti became a pupil of Ford Madox Brown in 1848. At that date, Rossetti and Hunt shared lodgings in Cleveland Street, Fitzrovia, Central London. Hunt had started painting The Eve of St. Agnes based on Keats's poem of the same name, but it was not completed until 1867. As an aspiring poet, Rossetti wished to develop the links between William Michael Rossetti, and sculptor Thomas Woolner, had joined to form a seven-member-strong brotherhood. Ford Madox Brown was invited to join, but the more senior artist remained independent but supported the group throughout the PRB period of Pre-Raphaelitism and contributed to The Germ. Other young painters and sculptors became close associates, including Charles Allston Collins, Thomas Tupper, and Alexander Munro. The PRB intended to keep the existence of the brotherhood secret from members of the Royal Academy. The principles were deliberately non-dogmatic, since the brotherhood wished to emphasise the personal responsibility of individual artists to determine their own ideas and methods of depiction. Influenced by Romanticism, the members thought freedom and responsibility were inseparable. Nevertheless, they were particularly fascinated by medieval culture, believing it to possess a spiritual and creative integrity that had been lost in later eras. The emphasis on medieval culture clashed with principles of realism which stress the independent observation of nature. In its early stages, the Pre-Raphaelite Brotherhood believed its two interests were consistent with one another, but in later years the movement divided and moved in two directions. The realists were led by Hunt and Millais, while the medievalists were led by Rossetti and his followers, Edward Burne-Jones and William Morris. The split was never absolute, since both factions believed that art was essentially spiritual in character, opposing their idealism to the materialist realism associated with Courbet and Impressionism. The Pre-Raphaelite Brotherhood was greatly influenced by nature and its members used great detail to show the natural world using bright and sharp focus techniques on a white canvas. In attempts to revive the brilliance of colour found in Quattrocento art, Hunt and Millais developed a technique of painting in thin glazes of pigment over a wet white ground in the hope that the colours would retain jewel-like transparency and clarity. Their emphasis on brilliance of colour was a reaction to the excessive use of bitumen by earlier British artists, such as Reynolds, David Wilkie and Benjamin Robert Haydon. Bitumen produces unstable areas of muddy darkness, an effect the Pre-Raphaelites despised. In 1850, the Pre-Raphaelite Brotherhood became the subject of controversy after the exhibition of Millais' painting Christ in the House of His Parents was considered to be blasphemous by many reviewers, notably Charles Dickens. 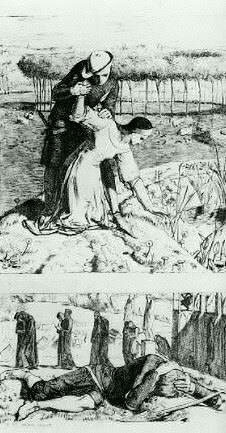 Dickens considered Millais' Mary to be ugly. Millais had used his sister-in-law, Mary Hodgkinson, as the model for Mary in his painting. The brotherhood's medievalism was attacked as backward-looking and its extreme devotion to detail was condemned as ugly and jarring to the eye. According to Dickens, Millais made the Holy Family look like alcoholics and slum-dwellers, adopting contorted and absurd "medieval" poses. A rival group of older artists, The Clique, used its influence against the Pre-Raphaelite Brotherhood and its principles were publicly attacked by the President of the Academy, Sir Charles Lock Eastlake. After the controversy, Collinson left the brotherhood and the remaining members met to discuss whether he should be replaced by Charles Allston Collins or Walter Howell Deverell, but were unable to make a decision. From that point the group disbanded, though its influence continued. Artists who had worked in the style initially continued but no longer signed works "PRB". The brotherhood found support from the critic John Ruskin, who praised its devotion to nature and rejection of conventional methods of composition. The Pre-Raphaelites were influenced by Ruskin's theories and he wrote to The Times defending their work and subsequently met them. Initially, he favoured Millais, who travelled to Scotland in the summer of 1853 with Ruskin and Ruskin's wife, who was Euphemia Chalmers Ruskin, née Gray (now best known as Effie Gray). The main object of the journey was to paint Ruskin's portrait. 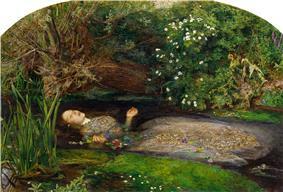 Effie became increasingly attached to Millais, creating a crisis. In subsequent annulment proceedings, Ruskin himself made a statement to his lawyer to the effect that his marriage had been unconsummated. The marriage was annulled on grounds of non-consummation, leaving Effie free to marry Millais, but causing a public scandal. Millais abandoned the Pre-Raphaelite style after his marriage, and Ruskin savagely attacked his later works. Ruskin continued to support Hunt and Rossetti and provided funds to encourage the art of Rossetti's wife Elizabeth Siddal. 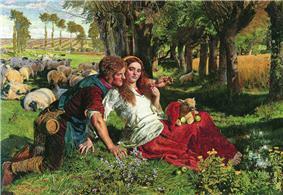 By 1853 the original PRB had virtually dissolved, with only Holman Hunt remaining true to its stated aims. But the term "Pre-Raphaelite" stuck to Rossetti and others, including William Morris and Edward Burne-Jones, with whom he became involved in Oxford in 1857. Hence the term Pre-Raphaelite is associated with the much wider and long-lived art movement, including the dreamy, yearning images of women produced by Rossetti and several of his followers. Pre-Raphaelite murals in the Old Library at the Oxford Union]. This podcast covers their painting. Oxford Brookes University has a series of podcasts on the Pre-Raphaelites in Oxford, with this one on YouTube dedicated to the Union murals. Leighton House Museum (2014). A Victorian obsession: the Pérez Simon collection at Leighton House Museum, 14 November 2014 – 29 March 2015. Exhibition guide. 75p. London, Leighton House Museum. ^ Hilton, Timothy (1970). The Pre-Raphaelites, p. 46. Oxford University Press. ^ a b McGann, Jerome J. The Complete Writings and Pictures of Dante Gabriel Rossetti, NINES consortium, Creative Commons License; http://www.rossettiarchive.org/docs/s40.rap.html retrieved 16 December 2012. ^ a b Hilton (1970), pp. 28–33. ^ Slater, Michael (2009). Charles Dickens, p. 309. Yale University Press. ^ Andres, Sophia (2005). The Pre-Raphaelite Art of the Victorian Novel: Narrative Challenges to Visual Gendered Boundaries, p. 9. Ohio State University Press. ^ The Times, Saturday, 3 May 1851; pg. 8; Issue 20792: Exhibition of the Royal Academy. (Private View. ), First Notice: "We cannot censure at present, as amply or as strongly as we desire to do, that strange disorder of the mind or the eyes which continues to rage with unabated absurdity among a class of juvenile artists who style themselves "P.R.B.," which being interpreted means Pre-Raphael Brethren. Their faith seems to consist in an absolute contempt for perspective and the known laws of light and shade, an aversion to beauty in every shape, and a singular devotion to the minute accidents of their subjects, including, or rather seeking out, every excess of sharpness and deformity." ^ Dearden, James S. (1999). John Ruskin: A Life in Pictures, pp. 36–37. Sheffield Academic Press. ^ Phyllis Rose, Parallel Lives: Five Victorian Marriages, 1983, pp. 49–94. ^ Dearden (1999), p. 43. ^ a b D. Macmillan, Scottish Art 1460-1990 (Edinburgh: Mainstream, 1990), ISBN 0500203334, p. 213. ^ R. Barber, The Holy Grail: Imagination and Belief (Harvard University Press, 2004), ISBN 0674013905, p. 275. ^ See, for example, Bucher (2004) for a brief discussion on the influence of the Pre-Raphaelites on Tolkien. ^ Barringer, Tim (1999). Reading the Pre-Raphaelites, p. 17. Yale University Press. ^ Desperate Romantics press pack: introduction BBC Press Office. Retrieved on 2009-07-24. The story of the brotherhood, from its controversial first exhibition to being embraced by the art establishment, has been depicted in two BBC television series. The first, The Love School, was broadcast in 1975; the second is the 2009 BBC television drama serial Desperate Romantics by Peter Bowker. Although much of the latter's material is derived from Franny Moyle's factual book Desperate Romantics: The Private Lives of the Pre-Raphaelites, the series occasionally departs from established facts in favour of dramatic licence and is prefaced by the disclaimer: "In the mid-19th century, a group of young men challenged the art establishment of the day. 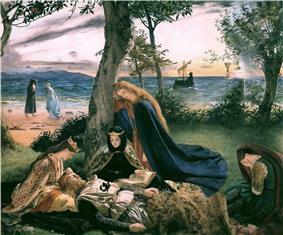 The pre-Raphaelite Brotherhood were inspired by the real world around them, yet took imaginative licence in their art. This story, based on their lives and loves, follows in that inventive spirit." Ken Russell's television film Dante's Inferno (1967) contains brief scenes on some of the leading Pre-Raphaelites but mainly concentrates on the life of Rossetti, played by Oliver Reed. Kelmscott Manor, the country home of William Morris from 1871 until his death in 1896, owned by the Society of Antiquaries of London, is open to the public. The Manor is featured in Morris' work News from Nowhere. It also appears in the background of Water Willow, a portrait of his wife, Jane Morris, painted by Dante Gabriel Rossetti in 1871. There are exhibitions connected with Morris and Rossetti’s early experiments with photography. There is a set of Pre-Raphaelite murals in the Old Library at the Oxford Union, depicting scenes from the Arthurian legends, painted between 1857 and 1859 by a team Dante Gabriel Rossetti, William Morris and Edward Burne-Jones. The National Trust houses at Wightwick Manor, Wolverhampton, and at Wallington Hall, Northumberland, both have significant and representative collections. Andrew Lloyd Webber is an avid collector of Pre-Raphaelite works and a selection of 300 items from his collection were shown at an exhibition at the Royal Academy in London in 2003. 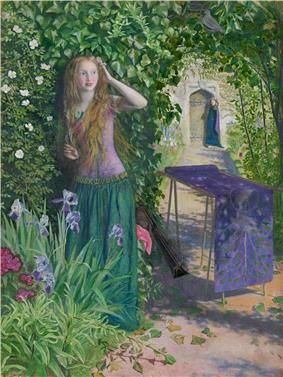 There are major collections of Pre-Raphaelite work in Birmingham Museum and Art Gallery, the Tate Gallery, Victoria and Albert Museum, Manchester Art Gallery, Lady Lever Art Gallery, and Liverpool's Walker Art Gallery; the Art Gallery of South Australia and the Delaware Art Museum have the most significant collections of Pre-Raphaelite art outside the United Kingdom. The Museo de Arte de Ponce In Puerto Rico has a notable collection of Pre-Raphaelite works, including Sir Edward Burne-Jones' "The Last Sleep of Arthur in Avalon", Frederic Lord Leighton's "Flaming June", and works by William Holman Hunt, John Everett Millais, Dante Gabriel Rossetti, and Frederic Sandys. In the 20th century artistic ideals changed and art moved away from representing reality. Since the Pre-Raphaelites were fixed on portraying things with near-photographic precision, though with a distinctive attention to detailed surface-patterns, their work was devalued by many painters and critics. After the First World War, British Modernists associated Pre-Raphaelite art with the repressive and backward times in which they grew up. In the 1960s there was a major revival of Pre-Raphaelitism. Exhibitions and catalogues of works, culminating in a 1984 exhibition in London's Tate Gallery, re-established a canon of Pre-Raphaelite work. Among many other exhibitions, there was another large show at Tate Britain in 2012–13. Birmingham Museum & Art Gallery has a world-renowned collection of works by Burne-Jones and the Pre-Raphaelites that, some claim, strongly influenced the young J. R. R. Tolkien, who wrote The Hobbit and The Lord of the Rings, with influences taken from the same mythological scenes portrayed by the Pre-Raphaelites. The movement influenced many later British artists into the 20th century. Rossetti came to be seen as a precursor of the wider European Symbolist movement. In the late 20th century the Brotherhood of Ruralists based its aims on Pre-Raphaelitism, while the Stuckists and the Birmingham Group have also derived inspiration from it. Pre-Raphaelitism had a significant impact in Scotland and on Scottish artists. The figure in Scottish art most associated with the Pre-Raphaelites was the Aberdeen-born William Dyce (1806–64). Dyce befriended the young Pre-Raphaelites in London and introduced their work to Ruskin. His later work was Pre-Raphaelite in its spirituality, as can be seen in his The Man of Sorrows and David in the Wilderness (both 1860), which contain a Pre-Raphaelite attention to detail. Joseph Noel Paton (1821-1901) studied at the Royal Academy schools in London, where he became a friend of Millais and he subsequently followed him into Pre-Raphaelitism, producing pictures that stressed detail and melodrama such as The Bludie Tryst (1855). His later paintings, like those of Millias, have been criticised for descending into popular sentimentality. Also influenced by Millias was James Archer (1823-1904) and whose work includes Summertime, Gloucestershire (1860) and who from 1861 began a series of Arthurian-based paintings including La Morte d'Arthur and Sir Lancelot and Queen Guinevere. After 1850, Hunt and Millais moved away from direct imitation of medieval art. They stressed the realist and scientific aspects of the movement, though Hunt continued to emphasise the spiritual significance of art, seeking to reconcile religion and science by making accurate observations and studies of locations in Egypt and Palestine for his paintings on biblical subjects. In contrast, Millais abandoned Pre-Raphaelitism after 1860, adopting a much broader and looser style influenced by Reynolds. William Morris and others condemned his reversal of principles. After 1856, Dante Gabriel Rossetti became an inspiration for the medievalising strand of the movement. He was the link between the two types of Pre-Raphaelite painting (nature and Romance) after the PRB became lost in the later decades of the century. Rossetti, although the least committed to the brotherhood, continued the name and changed its style. He began painting versions of femme fatales using models like Jane Morris, in paintings such as Proserpine, The Blue Silk Dress, and La Pia de' Tolomei. His work influenced his friend William Morris, in whose firm Morris, Marshall, Faulkner & Co. he became a partner, and with whose wife Jane he may have had an affair. Ford Madox Brown and Edward Burne-Jones also became partners in the firm. Through Morris's company, the ideals of the Pre-Raphaelite Brotherhood influenced many interior designers and architects, arousing interest in medieval designs and other crafts leading to the Arts and Crafts movement headed by William Morris. Holman Hunt was involved with the movement to reform design through the Della Robbia Pottery company.